A screen grab of Banksy's opening scene. The notorious British street artist Banksy has left San Francisco and moved onto Springfield. Last April, Banksy sightings were reported up and down the streets of San Francisco as a new documentary about his life called "Exit Through the Gift Shop" was set to premiere. Artwork -- or graffiti if you prefer -- by the elusive artist was seen from Chinatown to the Mission but like most Banksy sightings, no one actually saw the tagger. Nonetheless, the street art caused quite a stir, with some of the pieces even been localized to honor San Francisco icons such as Frank Chu. But none of the pieces caused quite the stir that Banksy's latest piece is causing. The artist was commissioned by the creators of "the Simpsons" to add a little spice to its opening animation. After months of back and forth with the producers of the show, Banksy handed over a dark critique of how he believes the show is produced. 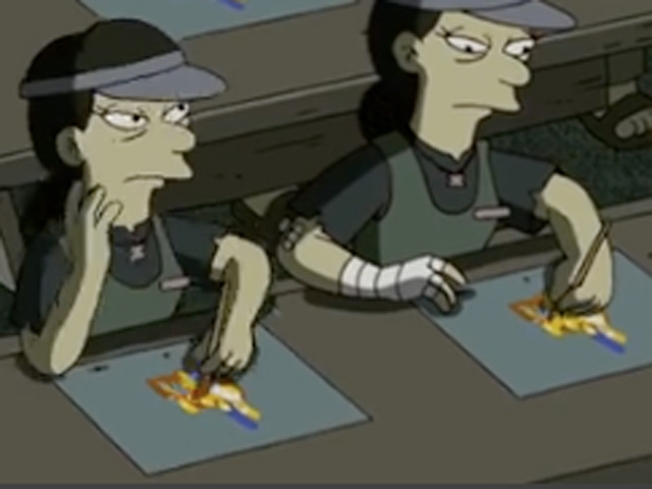 Once the family sits on the couch in the opening credits, as they always do, the camera pans out and into a sweatshop showing Asian workers drawing the cartoon characters and making products for the show. The opening sequence has upset some who say the depiction was too graphic and others who wonder how Fox, who does ship some of the animation work from the show overseas, allowed the commentary to run. But for those familiar with Banksy, why would you expect anything different?